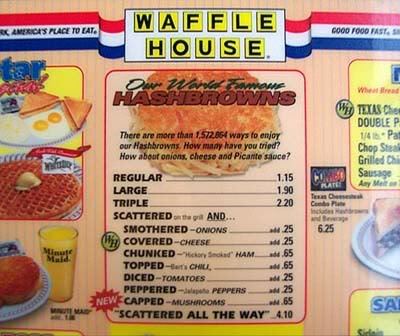 It's the hash browns where the Waffle House really shines. Prepare Hash Browns as directed. Leave in skillet, add cheese, onion, jalapeno peppers, tomatoes, mushrooms and ham. When done, add chili on top of all. 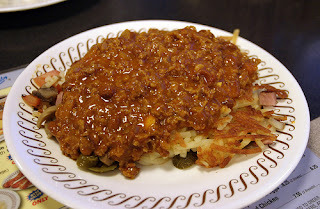 Waffle House Hash Browns "Scattered, Smothered, and Covered"
Heat the oil on a large, flat cast iron griddle or skillet over medium-high heat. Immediately "scatter" the potatoes over the oil. Season with salt, to taste. "Scatter" over the onions and cook, without stirring, until the outermost edges have started to brown, about 2 1/2 minutes. Flip the hash browns with a spatula, and place the cheese on top. Let the cheese melt, about 30 seconds. Transfer the hash browns to a plate and serve immediately. For those unfamiliar with Waffle House terminology, scattered means spread out on the flat griddle and cooked on both sides, instead of cooked in a ring and similar to a cake. Light refers to the degree of doneness, meaning not too browned. Smothered adds chopped onions to the potatoes. Peppered adds sliced jalapenos, and topped means covered with chili. You can also get them diced, which means with chopped tomato; chunked, diced ham; and covered means with a slice of cheese over the top. They will also add mushrooms. Melt 1 Tablespoon margarine in a medium sized non-stick skillet,over medium heat. Add onion and diced ham,cook until onion is soft and ham is heated through. Spread ham and onion into an even layer,add rest of margarine in center of ham/onion mixture. Cover ham/onion mixture evenly with shredded potatoes. Cover potatoes with salt and pepper. Cover with lid and let brown for about 5 to 10 minutes. (depending on how brown you like your potatoes). Remove lid and divide into 4 pieces,turn each piece over to brown other side. I make mine about the same as what you have shown. And they are good. But not Waffle House hash browns. Their's come out light fluffy. Not sure if it they type of cooking oil they use. One guy called it " low melt " Or is it something they put into the potato ? They have a big honkin bag of hash browns. Most of the time the door is open and the hash browns are at room tempt. You shred up a potato and leave it out in room tempt. and see what happens. It will turn brown. I ordered me a set of those rings to see if that would help. Let them soak is cold water. They stuck together because of the starchiness.